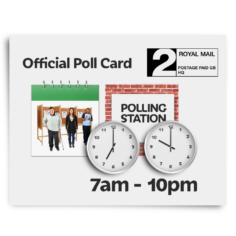 Before an election or a referendum, the council will send you a polling card. Polling is another name for voting. This card will tell you when the voting day is and where you can vote. 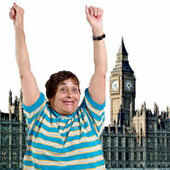 On the day of the vote, you can go to the polling station which is the name for the place where people vote. This is usually in a local hall or school. It will be near where you live. You can usually vote up until 10pm on voting day. 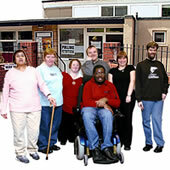 You do not need your polling card to vote but you might find it helpful to have it with you. At the polling station, you will then be given a ballot paper. The ballot paper will say what you can vote for. 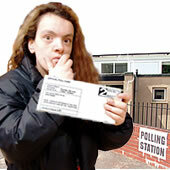 The people at the polling station will help you by showing you what to do if you ask them to. 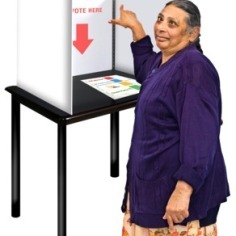 Once you have your ballot paper, you go to one of the polling booths. 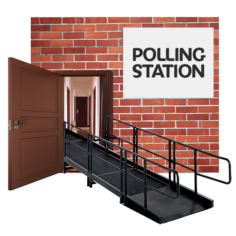 A polling booth is an area where you can vote in private. 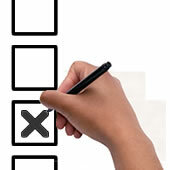 To vote, you put a cross in the box on the ballot paper next to the option you want to vote for. Then you fold up your ballot paper so no one can see it and put it in the ballot box. A ballot box is a locked box where all votes are kept safely. 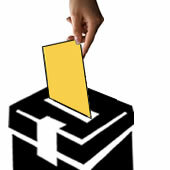 When the voting is finished, the ballot boxes are taken to a place where the votes are counted. There are people there to make sure this is done fairly. The option with the most votes will win.